Chocolate banana brownies studded with copious amounts of dulce de leche. Do I need to add anything more except the recipe to this post? This is definitely a brownie recipe that you will want to make. You’ll want to eat and then you’ll want to make it again, and again and again. Have you ever pranced around your kitchen doing a happy dance? That wiggle with a smile when you know you have created something pretty damn awesome. A creation that deliciously tantalises every single tastebud in your mouth. Well I did, I pranced, I threw in a Saturday Night Fever move or two, and I may have even fist pumped with a ‘hell yeah’. I woke up that morning craving chocolate brownies. Surely I am not the only one that has ever done this? But there were 5 small sugar bananas dying in the fruit bowl that had other ideas. And that folks, is how the chocolate banana brownie idea came into my head. And the dulce de leche? It just seemed like a really good idea at the time. Oh my goodness, it turned out to be quite a brilliant one. 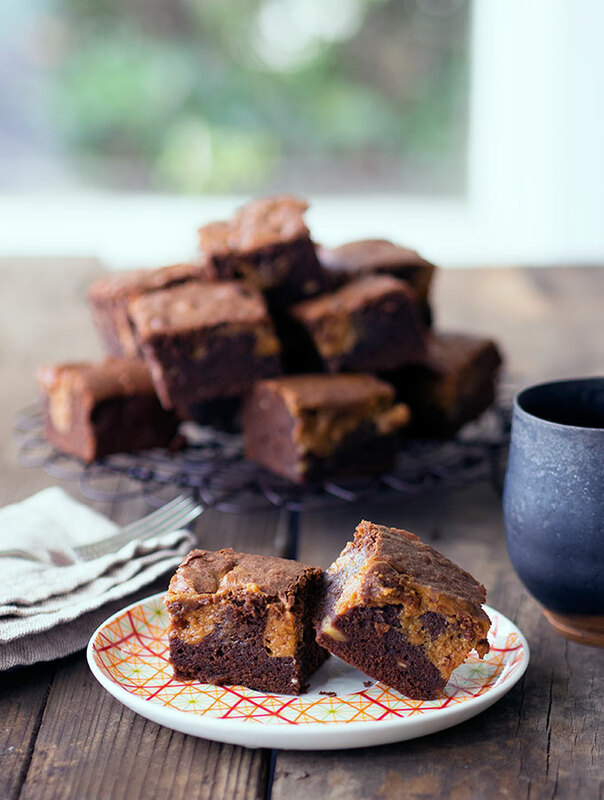 Chocolate, bananas and caramel, these brownies are a thing of sheer deliciousness. Firstly you will need to do for this recipe is make the dulce de leche. You can of course you a good quality store bought one if you wish. Preheat oven 220 deg C (425 deg F). In a small ovenproof dish place condensed milk and securely cover with foil. Place dish in a larger baking dish and fill with water half way up the dish containing the condensed milk. Bake for 1 hour 30 minutes or until deep golden in colour, a caramel colour. Remove from oven and leave to the side to cool. While the dulce de leche is cooling turn down the oven to 180 deg C (360 deg F). Grease and line a 30cm x 20cm brownie pan. In a medium size bowl melt butter and chocolate. I melt in a microwave, just make sure you are checking and stirring often so as not to burn your chocolate. Leave chocolate mixture to the side to cool slightly while beating eggs and sugar in a large bowl until combined. Mix mashed bananas into chocolate mixture. Then mix in egg and sugar mix. Then sift flour into the bowl and add salt. Pour brownie mix into greased and lined tine. Siir dulce de leche in the baking dish until it is smooth. Dollop over the top of the brownie mix. Use a knife to ‘swizzle’ the dulce de leche through the brownie slightly. Place in the oven and bake for around 35 minutes until it is cooked through. Test with skewer. Remove and allow to cool before cutting into desired sized portions. Store in air tight container. This recipe makes a bucket load of brownies, way more than a normal household can devour in a couple of days. So it’s a good thing these guys freeze. Wrap individually and freeze, defrost and eat. Of course feel free to eat the lot. Please tell me I’m not the only bum wiggling happy dancer out there? I can imagine the burst of flavours in my mouth with this chocolate banana brownies with caramel. Sinfully delicious! Lol, I can picture you doing a happy dance. And why would you not, when something as delicious as these had just been created? Yup, I think it is pretty easy to imagine me getting excited in the kitchen. Woo hoo, a fellow bum wiggle dancer! Glad you like the the sound of the recipe. These babies look just as gorgeous as I imagined them when you first explained the recipe to me! Love it. 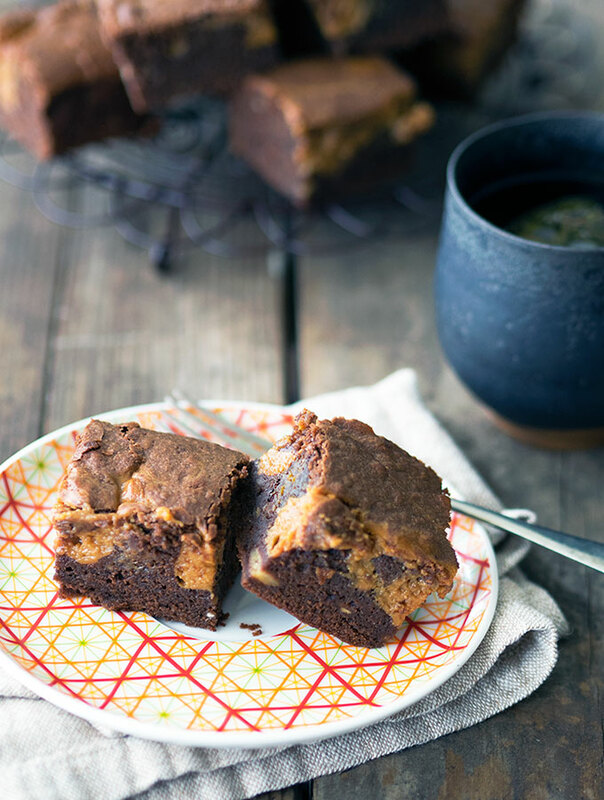 These brownies look and sound SO delicious – just obsessed with the dulce de leche addition! The addition of the dulce de leche worked so well. Really is a great flavour combination. Chocolate & caramel is always a great combo. Bloody brilliant idea Sara, You should be doing a happy dance. Nope, you’re not the only bum wiggling happy dancer out there! I do it too, often! 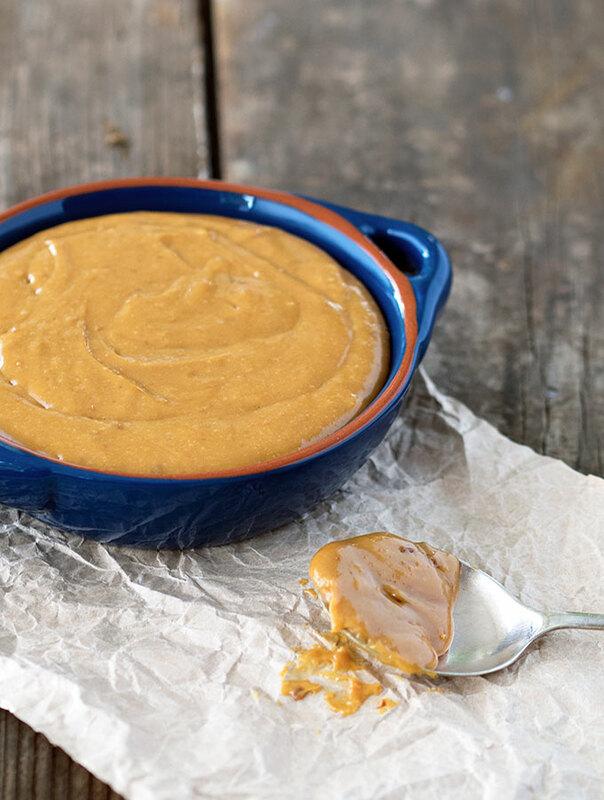 : D Love this recipe… and as for that dulce de leche… are you serious?! It’s that easy! *Happy dance* LOL.